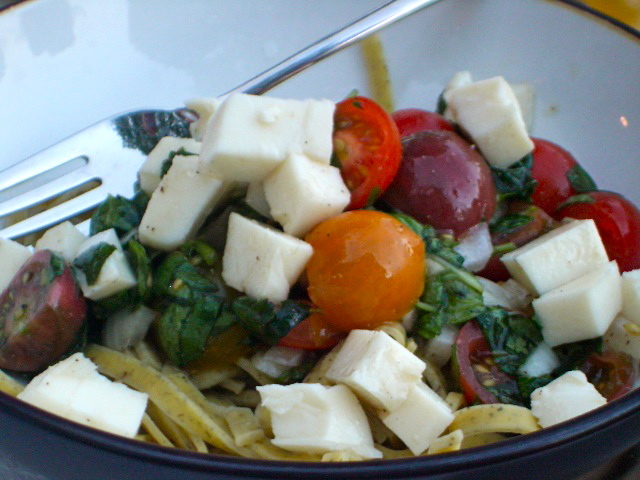 In a large bowl, gently combine the tomatoes, onion, oil, mozzarella, 1 1/2 teaspoons salt, and 3/4 teaspoon pepper. Set aside and let marinate at room temperature for at least 10 minutes. Meanwhile, cook the pasta according to the package directions. Add the drained pasta and basil to the marinated tomatoes and toss to combine. Divide among individual bowls. Also! The longer the tomato mixture marinates, the more flavorful it becomes. Keep it in the refrigerator for up to 2 days. Spoon it over chicken or warm bread.